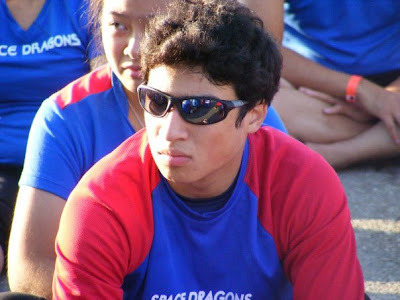 Space Dragons Dragon Boat Racing Team: Paddler Spotlight - Allan! Year End Banquet coming up! Allan is excited, are you? hmmmm, well chicken and vegetables is the magic combo for me on a lot of days. Pizza, eggs, Hawaiian BBQ, YOGURTLAND!!!! (although I don't get to have it too often). Rice, salmon, and some other things. It comes down to what will feed you for the day. joined P.OS.E.R.S. around summer of 2007 (or was it 2006?) and continued paddling only during summers. Joined space dragons in August of 2009 for year round dragonboating. it's a great workout that really trains all the muscles of the upper body, and also for spending time with the great people on the team. I would say angry because whenever I get angry during practice I get an extra rush of energy, and I force myself to focus more on my technique. Plus I love yelling. I try to really stay strict about my workouts about two - three weeks before the tournament, and focus especially on core, back, and shoulders. I also try to increase my cardio before workouts. A week before the race, I take it easier and rest up the last days before the race. Weight Training and working out, keeping up with school work, spending time with friends. Personal Training as a part time job. Contemplating life and the universe. Being a relatively new paddler myself, I can say from experience that it takes time and patience. Don't beat yourself up about what you're doing wrong, cause everyone does something wrong. Listen to the coaches, train hard outside of paddling, and with time the paddling becomes better. Everyone really goes out of their way to create a positive and supportive atmosphere, so don't feel like they're here to judge you. Nothing. The team is great just the way it is. wow so many to name. Galen, Brian, Jason, Tran, Emily, Pearl, Janice, Robert, Jennifer, Caesar, Wade, Phil, Blanca...just so many to name. A lot of team has been so nice and so outgoing, while at the same time teaching me things that I needed to learn. Everyone has something about them that makes them unique. If anyone ever feels alone and needs a friend to talk to, I'm always there for them for compassion and support. I knew the P.O.S.E.R.S. had come from the space dragons when I wanted to do dragonboating year round. The P.O.S.E.R.S. were friends of a friend. What is an important life lesson you have learned? Redemption is rarely earned, for a good conscience never learns to truly forgive itself.